Home/GJG, Tree Plantings in Victoria/Trees go west thanks to GJG. Ross Morley, Managing Director of G. J. Gardner Homes has been supporting our native environment (through Fifteen Trees) since 2013 and has now helped plant over 44,000 trees across Victoria and Tasmania. For every new home built, Fifteen Trees organises the planting of 15 trees in the local district. This year alone the project will see over 11, 310 trees planted by schools, landcare and various environmental groups. Ben Longhurst from G. J. Gardner Homes Bacchus Marsh is a generous supporter of local community groups and their tree planting projects. 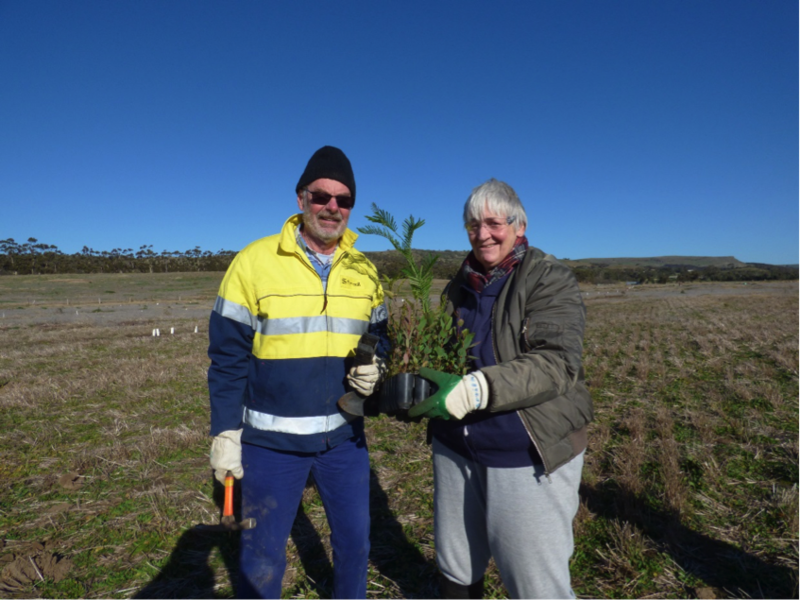 This year, the Bacchus Marsh team purchased 540 trees for Grow West‘s 13th Annual Planting Day which took place on Sunday 15th July. Massive Community Spirit at Bacchus Marsh. ‘The annual planting day is one of the Grow West’s biggest events and is an important opportunity to rejuvenate and restore local landscapes. This year, the planting day was held at Sheoak Hill, a 552ha former cropping and grazing property nestled between Brisbane Ranges National Park and Werribee Gorge State Park, in the Rowsley Valley. Over 190 volunteers attended and together they planted 5,433 seedlings at the property of Paul Dettman. The goal of the Sheoak Hill project is to re-establish a link between the two parks by managing existing vegetation, controlling weeds and rabbits and revegetating both the flats as wells as the shallow and highly erodible hillsides. Thank you to Ben and the team at G.J. Gardner Homes Bacchus Marsh for providing us with 540 trees for this project’. Two of the wonderful volunteers who turned up to plant over 5,000 trees with Grow West. Thank you Emma and Grow West for finding such a great home for our trees. This is an amazing long term project, and G.J. Gardner and Fifteen Trees are delighted to be a part of your plan and vision.